I created this ensemble with the Moncler Edward jacket being the main attraction. This jacket is perfect for the chilly weather that is approaching us. Whether someone is wearing this outfit on a production or just a random day out they will look great. 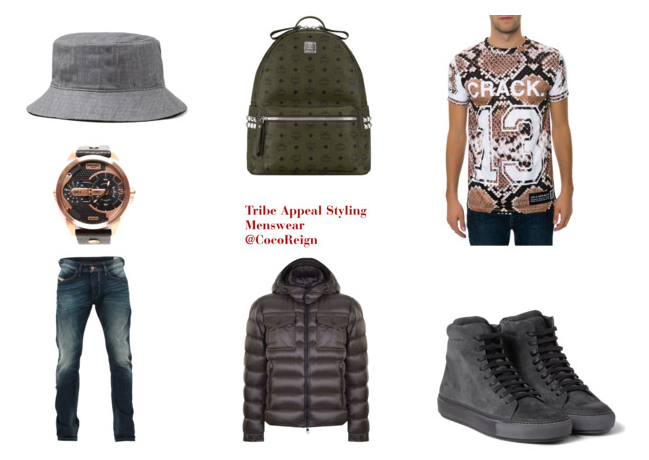 The top is a snakeskin print Love Is Earth jersey from KarmaLoop.Com, sneakers are Acne Studios Adrian high tops, backpack is MCM and the denim and watch are Diesel. The grey, green and brown color scheme of this outfit is very different, but it is very pleasing to the eye. This girl has got it! Many of us first heard of Tiara Thomas after hearing her vocals on Wale’s smash hit “Bad”. After hearing her sultry voice paired with acoustics we became instant fans.Her single “Tell Me Something” really grabbed our attention and had us wanting more. Tiara, who is signed to Rico Love’s Division 1 record label just released her single from her upcoming album “One Night”.This fashionista is someone to watch as her songwriting is something to contend with in this generation of meaningless songs. She mixes her singing with some raw rapping that creates instant magic. The song is so catchy (thanks to Rico’s amazing producing) and definitely spills the truth when it comes to females and that special one.Take a listen to Tiara telling it like it is.